View of the River Flesk near Killarney, County Kerry in Ireland. The river flows into the lower of the three lakes of the area, Lough Leane. It is a tributary of the Bush River in Ulster and flows through boglands. 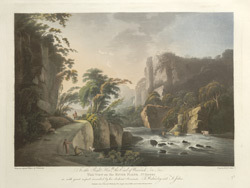 This aquatint depicts a small waterfall on the river with 2 fishermen in the foreground and the mountains in the background.